If a TextBlock is set to wrap text automatically, you can also tell it to automatically hyphenate by setting its IsHyphenationEnabled property to true. 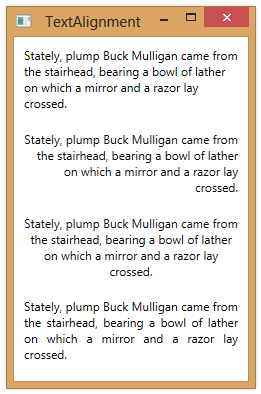 In the example below, the first two blocks of text are left justified, but the second block has hyphenation enabled. The third block enables hyphenation for a justified block of text. 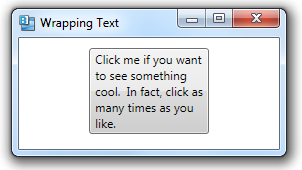 You can use either Label or TextBlock elements to display text in an application. 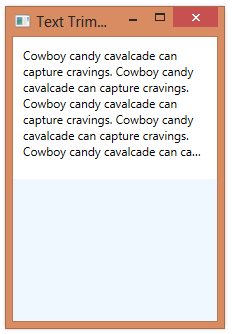 You can apply one of several different text decorations to a block of text by using the TextDecorations property for a TextBlock control. 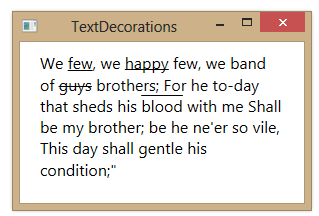 But setting this property means that the decoration chosen applies to all text contained within the TextBlock. Alternatively, you can apply one of the four text decorations (Underline, Baseline, StrikeThrough or Overline) to a subset of the text by using a Run element. 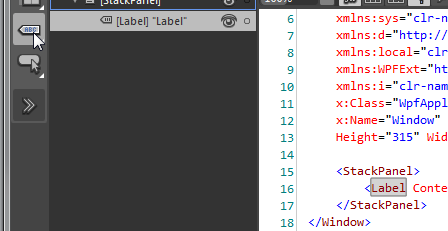 (Note: In the example below, we use an Underline tag directly, rather than setting the TextDecorations property on a Run element). This day shall gentle his condition;"
You can add text-based controls to your user interface by clicking on one of the related icons on the tools panel in Blend. 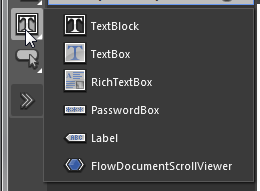 If you left-click and hold on the TextBlock icon on the tools panel, or right-click, you’ll see a series of controls that you can insert by clicking on the icon at this location in the tools panel. Select the control from this list that you want and then double-click the icon on the tools panel to insert an instance into your user interface.